Tomatoes have been cultivated for a very long time – thousands of varieties exist. 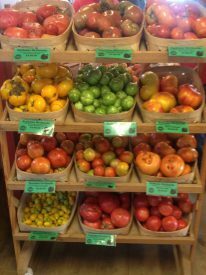 Early varieties “heirloom” were local favorites but usually had some flaw, not beautiful, too perishable., low production – so over the years tomato varieties were bred to correct these problems successfully except for taste – the old varieties taste great! So many growers have gone back to the “heirloom” varieties because they taste great! At Terhune Orchards we grow all our tomatoes organically. We plant a wide variety ranging from traditional beefsteak to heirloom varieties. Heirloom varieties are types of tomatoes that have been passed down through generations. Each heirloom variety has its own set of unique traits and has evolved over time to adapt to specific growing conditions and climates. Variety is beneficial because it reduces the chance of plant epidemics and infestations. As farmers and stewards of the Earth, we are committed to keeping the diversity of these vegetables alive and viable. We grow many different delicious varieties and highlighted a few of them below. Check the farm store for in-season updates. Abraham Lincoln Old time juicy variety packed with great tomato flavor. A Tender, fine texture with a fair amount of nicely tempered sweetness. A Popular since the 1920s. Arkansas Traveler Developed by the University of Arkansas in 1968, well known for its ability to produce in hot weather. Black Cherry A blackish-purple skinned cherry tomato with dark red flesh and a sweet, juicy flavor. Box Car Willy Smooth red tomato with tart-sweet flavor. Texture makes it a great slicing tomato. Brandywine Dates back to 1885 and is regarded as one of the world’s finest flavored “beefsteak” tomatoes. Clear skinned, light rosy pink fruit that has meaty and juicy flesh. Believed to have Amish origins. Cherokee Purple Full flavored medium large dusky pink with dark shoulders thought to be grown originally by the Cherokee. Garden Peach This heirloom is colored exactly like a peach and has a sweet mild flavor, perfect for salads. It is rich in iron and Vitamin B15. Originally from South America. Glory of Moldova When fully ripe interiors are carrot orange. Flavor is fruity and sweet. Green Zebra Green skin with dark green stripes. The meaty flesh is lime-emerald in color and has an invigorating lemon-lime flavor. Marianna’s Peace Creamy dense pink flesh with flavor similar to Brandywine. Marvel Stripe Favorite among many for the combination of beauty, color and taste. Yellow-orange streaked with ruby red. Sweet fruity taste. Originally from Oaxaca Mexico. Mortgage Lifter Pink meaty fruit with few seeds. According to lore, originated by M.C. Bayles, aka “Radiator Charlie” sold it for $1.00 per plant (back in the 1940s when a dollar meant something) in order to pay off his mortgage. When his radiator repair business slumped, he started crossbreeding his 4 best plants until he got a variety which tasted better and had larger fruit. He promoted it as being able to feed a family of 6, thus justifying the price of $1.00 per plant, and paying off his house in just 4 years! Yellow Brandywine The huge meaty fruit of the Brandywine with yellow skin and flesh. Juicy flesh has more flavor than other yellow varieties. Yellow Pear Miniature pear-shaped with sweet flavor. Considered by some as “garden candy”.